This summer I always have dough or batter in the fridge. Dough from Artisan Bread in 5 minutes a day, usually Olive oil dough, rarely Brioche dough. We were surfeit with pizzas and foccaccias and I still had some olive oil dough in the fridge. Now this is a very healthy dough - made completely of Whole Wheat flour (Chapathi flour), ground in small batches from Organic Wheat. The scant 1/4 cup oil used is Extra Virgin Olive Oil. The junk craving devil lurking inside decided to tip the scales by deep frying this dough. With Cheese/Chocolate inside to boot!. 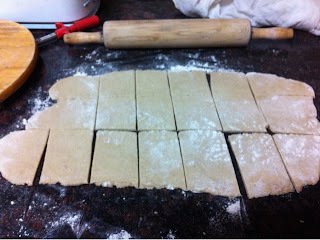 I was looking for a samosa like skin, so I rolled the dough quite thin - 3 - 4 mm thickness. I then stuffed it with either a mix of paneer+cheddar cheese + fresh ground pepper+ powder or a 1 cm square of dark baking chocolate. I fried it in sunflower oil and viola! It disappeared faster than the cooling rate!